London’s index of leading shares plunged below the psychologically important 5000 mark at one stage but reclaimed some of the falls to close at 5040.76, just over 1pc down on the day. 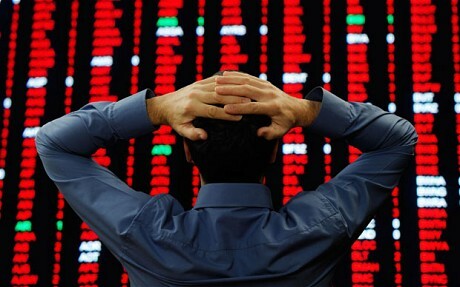 Traders and investors dumped stocks amid continued fears over bank funding, the spread of the European debt crisis and the fragile US economy. Having endured the worst stock market fall since the financial crisis of 2008 on Thursday, traders fled from equities to less risky assets. The FTSE All-World equity index has fallen almost 20pc since May. Morgan Stanley yesterday warned that the US and Europe were “dangerously close to recession” despite co-ordinated efforts to revive growth. Gold was pushed to yet another record high – up 1.4pc to $1,850 an ounce, having earlier touched $1,877. Sovereign bonds of countries perceived to be safe havens – including the UK – also saw heavy demand, pushing German, US and UK yields sitting near record lows. The Japanese yen is at its highest level against the dollar since the Second World War. European and US markets also fell – Germany’s Dax lost another 2.2pc; the CAC 40 in Paris shed 1.9pc, while the Madrid IBEX exchange lost 2pc, even as Spain announced further austerity measures designed to boost confidence. The Dow Jones shed 1.6pc to close at 10,817.65 in New York, while the tech-heavy Nasdaq gave up early gains to also lose 1.6pc as traders dumped shares in late trading. In Britain, bank shares led the market falls, with Barclays, Lloyds Banking Group and Royal Bank of Scotland all closing yesterday at more than two-year lows. Barclays has lost about a fifth of its value over the past five days; RBS shares have fallen 22pc. Lloyds shares have almost halved since the start of the year and now stand at 28.38p. The collapse in bank stocks has shocked the market and there were few signs of confidence returning. The credit default swaps (CDS) of UK banks, which provide buyers with protection should a company miss an interest payment, widened yesterday highlighting increased market concerns about their funding. Barclays CDS increased by 0.4pc to about 390 basis points, pushing the annual cost of insuring £10m of the bank’s bonds to £390,000. It is now the riskiest UK bank in the eyes of the credit markets. Fears of another banking crisis were reflected in financial stocks across Europe. In France, which last week banned the short selling of financial companies’ shares, CDSs on Societe Generale and BNP Paribas soared. Meanwhile, Credit Suisse and UBS were both forced to issue statements denying they had been forced to go through the Swiss National Bank to access dollar funding. In its statement, Credit Suisse insisted that its “funding and liquidity positions are very strong – in all major currencies and especially in US dollars”.